The city was founded in 1728 by the Dano-Norwegian governor Claus Paarss when he relocated Hans Egede's earlier Hope Colony (Haabets Koloni) to the mainland, and was named Godthåb ("Good Hope"). The city officially adopted its current name in 1979, although the name "Godthåb" remained in use in Danish. "Nuuk" is the Kalaallisut word for "cape" (Danish : næs). 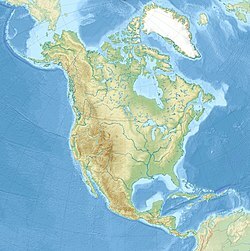 It is so named because of its position at the end of the Nuup Kangerlua fjord on the eastern shore of the Labrador Sea. Its latitude, at 64°10' N, makes it the world's northernmost capital, only a few kilometres farther north than the Icelandic capital Reykjavík. Major Claus Enevold Paarss was a Dano-Norwegian military officer and official. Retired from service, he was appointed governor of Greenland by King Frederick IV between 1728 and 1730. A headland is a coastal landform, a point of land usually high and often with a sheer drop, that extends into a body of water. It is a type of promontory. A headland of considerable size often is called a cape. Headlands are characterised by high, breaking waves, rocky shores, intense erosion, and steep sea cliffs. The University of Greenland is Greenland's only university. It is in the capital city of Nuuk. Most courses are taught in Danish, a few in Greenlandic and classes by exchange lecturers often in English. Statistics Greenland is a central statistical organization in Greenland, operating under the auspices of the Government of Greenland, working in cooperation with the Ministry for Finance. Based in Nuuk, the capital of Greenland, the organization was founded on 19 July 1989 by the Government of Greenland. The Public and National Library of Greenland is the public and national library of Greenland, located in Nuuk, the capital of Greenland. It is the largest reference library in the country, devoted to the preservation of national cultural heritage and history. The Buksefjord hydroelectric power plant is the first and largest hydroelectric power plant in Greenland. It was built by Nuuk-Kraft and it is operated by Nukissiorfiit - Greenland's national energy company. The Ameralik Span is the longest span of an electrical overhead power line in the world. It is situated near Nuuk on Greenland and crosses Ameralik Fjord with a span width of 5,376 metres at 64°6′18″N51°14′16″W. It was built in 1993 by the Norwegian company NTE Entreprise and is part of a single-circuit 132 kV powerline running from Buksefjord hydroelectric power plant to Nuuk. The site has a long history of habitation. The area around Nuuk was first occupied by the ancient pre-Inuit, Paleo-Eskimo people of the Saqqaq culture as far back as 2200 BC when they lived in the area around the now abandoned settlement of Qoornoq. For a long time, it was occupied by the Dorset culture around the former settlement of Kangeq but they disappeared from the Nuuk district before AD 1000. 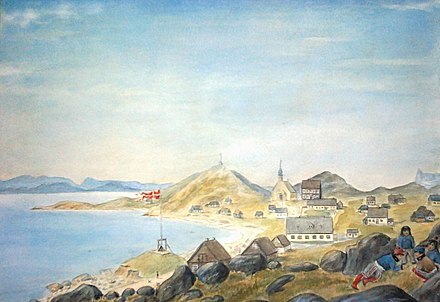 The Nuuk area was later inhabited by Viking explorers in the 10th century (Western Settlement), and shortly thereafter by Inuit peoples. Inuit and Norsemen both lived with little interaction in this area from about 1000 until the disappearance of the Norse settlement for uncertain reasons during the 15th century. The Paleo-Eskimo were the peoples who inhabited the Arctic region from Chukotka in present-day Russia across North America to Greenland prior to the arrival of the modern Inuit (Eskimo) and related cultures. The first known Paleo-Eskimo cultures developed by 2500 BCE, but were gradually displaced in most of the region, with the last one, the Dorset culture, disappearing around 1500 CE. The Saqqaq culture was a Paleo-Eskimo culture in southern Greenland. Up to this day, no other people seem to have lived in Greenland continually for as long as the Saqqaq. 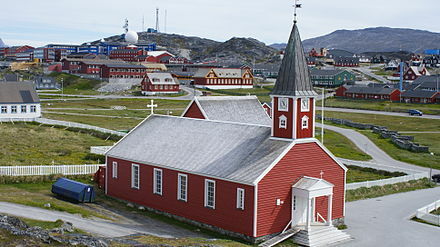 Qoornoq is an uninhabited fishing village in the Sermersooq municipality in southwestern Greenland. South Greenland was a Danish colony on Greenland consisting of the trading centers and missionary stations along the southwest coast of the island. Its capital was at Godthaab. The northernmost town of South Greenland was Holsteinborg, which bordered Egedesminde, which was the southernmost town of North Greenland. 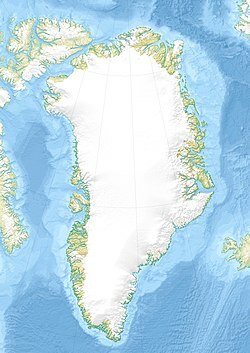 This boundary between South and North Greenland ran at around 68°N degree of latitude, and in the South, South Greenland stretched to 59°30'N, or to the southernmost point of Greenland. Around 1850, Greenland, and especially the area around Nuuk, were in crisis. 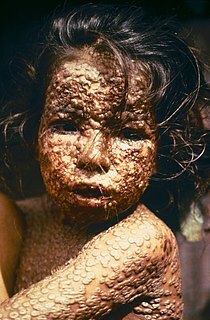 The Europeans had brought diseases and a culture that conflicted with the ways of the native Greenlanders. Many Greenlanders were living in poverty. In 1853, Hinrich Johannes Rink came to Greenland and perceived the Greenlanders had lost much of their culture and identity under Danish influence. In response, in 1861, he started the Atuagagdliutt , Greenland's first newspaper, with a native Greenlander as editor. This newspaper based in Nuuk later became significant for the Greenlandic identity. Nuuk has a maritime-influenced tundra climate (Köppen ET) with cold, long, snowy winters and cool, short summers. On 22 December, the shortest day and longest night of the year, the sun rises at 10:30 A.M. and sets at 2:20 pm. By contrast, on the longest day and shortest night of the year, 21 June, the sun rises at 3:00 A.M. and does not set until 12:00 am. Nuuk can have mild temperatures on brief occasions year round, with each month having recorded 13 °C (55 °F) or warmer. The monthly averages range from −7.5 °C (18.5 °F) to 8 °C (46 °F), whereas all-time extremes range from −32.5 °C (−26.5 °F) to 26.3 °C (79.3 °F). The climate (6.5 °C (43.7 °F) in July) is colder than what is considered the limit for trees (10 °C (50 °F) during the warmest month). There are a few planted trees  which do not sustain well. Nuuk has several educational institutions of higher learning. The University of Greenland (Ilisimatusarfik), the only university in Greenland, is in Nuuk. The university was founded in 1987 and expanded in 2007 with the new building called Ilimmarfik which houses departments of journalism, management and economics, language, literature and media, cultural and social history, theology and religion and social work. 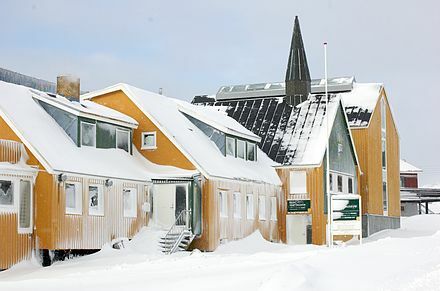 Nuuk is also home to the Department of Learning (Ilinniarfissuaq), the oldest educational facility in Greenland, in the old colonial part of Nuuk (Nuutoqaq: Old Nuuk). Other notable educational institutions include the Department of Nursing and Health Science, Nuuk Technical College and the Iron & Metal School. Shops in Nuuk offer local art and craftwork. In July 2012 Greenland's first shopping centre, Nuuk Center (abbreviated as NC), opened. The centre has Greenland's first underground parking. Several supermarkets exist, such as Nuuk Center, Pisiffik, Brugseni, and Spar. Nuuk has an international airport 4 km (2.5 mi) to the northeast of the town centre. Built in 1979, it is a hub for Air Greenland, which is also headquartered in Nuuk,  and operates its technical base at the airport. There are flights inside Greenland and to Iceland. There is a decision to extend the runway so that there can be flights to European destinations like Denmark. The Herrnhut House was the centre of the Moravian mission of New Herrnhut. Other landmarks include the Hans Egede Church and the Statue of Hans Egede. Greenland National Museum is in Nuuk and was one of the first museums established in Greenland, inaugurated in the mid-1960s. The museum has many artifacts and exhibits related to Greenland's archaeology, history, art, and handicrafts, and contains the Qilakitsoq mummies. Katuaq is a cultural centre used for concerts, films, art exhibitions, and conferences. It was designed by Schmidt Hammer Lassen and inaugurated on 15 February 1997. Katuaq contains two auditoria, the larger seating 1,008 people and the smaller, 508. The complex also contains an art school, library, meeting facilities, administrative offices and a café. The Nuuk Art Museum is the only private art and crafts museum in Greenland. The museum contains a notable collection of local paintings, watercolours, drawings, and graphics, some by Andy Warhol; and figures in soapstone, ivory, and wood, with many items collected by archaeologists. 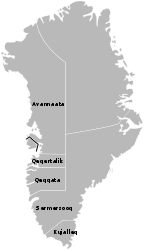 Ilisimatusarfik, the University of Greenland, is in Nuuk and is the national university of Greenland. Most courses are taught in Danish, although a few are in Kalaallisut as well. As of 2007 [update] , the university had approximately 150 students (almost all Greenlanders), around 14 academic staff, and five administrators. Its library holds approximately 30,000 volumes. 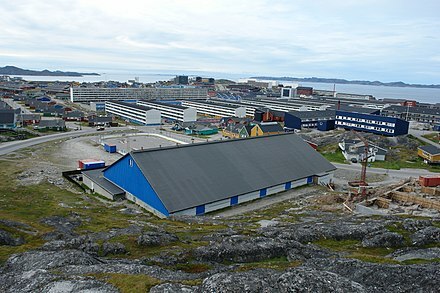 Nuuk Airport is an airport serving Nuuk, the capital of Greenland. The airport is a technical base and focus city for Air Greenland, the flag carrier airline of Greenland, linking the capital with several towns in western and south-western part of the country, including the airline hub at Kangerlussuaq Airport. With connections to Iceland, Nuuk Airport is also one of six international airports in Greenland but serves only destinations within Greenland and Iceland. International connections are made with flights to either Keflavík International Airport in Iceland or Kangerlussuaq Airport. Kapisillit is a settlement in the Sermersooq municipality in southwestern Greenland. In 2010, the settlement had 86 inhabitants. Kapisillit means the salmon in the Greenlandic language. The name refers to the belief that the only spawning-ground for salmon in Greenland is a river near the settlement. KANUKOKA is the national association of Greenland's municipalities, led by Palle Jeremiassen. The name is an acronym formed from the first two letters of each of the constituent words of the organization's name in the Greenlandic language. Nuussuaq is a district of Nuuk, the capital of Greenland, It is located in the northern part of the city, west and southwest of Nuuk Airport, approximately 4 km (2.5 mi) outside the city center. Nuup Kangerlua is a 160 km (99.4 mi) long fjord in the Sermersooq municipality in southwestern Greenland. It was formerly known by its colonial name as Godthaab Fjord, Gilbert Sound and Baal's River. Nuup Bussii A/S is a bus company in Nuuk, the capital of Greenland, providing public transport services for the city. As of 2014 Nuup Bussii has 31 employees, operating 16 buses with a distinct yellow color, as well as five other small vehicles. Qernertunnguit is a neighborhood of Nuuk, the capital of Greenland. It is part of the Quassussuup Tungaa district, located in the northwestern part of the town, facing the Nuup Kangerlua fjord. Nuuk Centrum is a district of Nuuk, the capital of Greenland. Together with the Old Nuuk neighborhood, it encompasses the southern and central part of the town. Most of the institutions and businesses are based in the district. Kalaaliaraq Market is a market in Nuuk, the capital of Greenland, located in the Old Nuuk neighborhood, approximately 150 m (490 ft) to the southeast of the Nuuk Cathedral. Its name means "The little Greenlander" in the Greenlandic language. 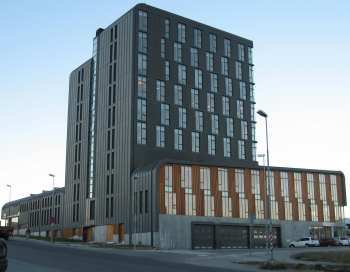 Blok P was the largest residential building in Nuuk, as well as the largest in all of Greenland. It contained around 320 apartments and it is said that approximately 1% of the total population of the entire country lived in the building. The building was demolished on 19 October 2012. Sermitsiaq Island is an uninhabited island in the Sermersooq municipality in southwestern Greenland. Qeqertarsuaq, meaning 'The Large Island' in the Greenlandic language, is an uninhabited island in the Sermersooq municipality in southwestern Greenland. Eksperimentet is a 2010 Danish drama film written and directed by Louise Friedberg, and starring Ellen Hillingsø. The film premiered on 28 August 2010 in the Katuaq Culture Centre in Nuuk, the capital of Greenland. The release date of the film in Denmark was 9 September 2010. LGBT Qaamaneq – Landsforeningen for Bøsser, Lesbiske, Biseksuelle og Transpersoner i Grønland is a lobby group for gay, lesbian, bisexual and transgender people in Greenland. ↑ Population in Greenland. CITYPOPULATION. Retrieved 13 December 2018. ↑ "Velkommen til Ilimmarfik". University of Greenland, Ilimmarfik. Archived from the original on 11 July 2010. Retrieved 11 July 2010. ↑ "Kontakt". University of Greenland. Archived from the original on 12 July 2010. Retrieved 11 July 2010. ↑ "Greenland hydro capacity increases with new plant". North of 56. 20 August 2013. Retrieved 21 December 2015. ↑ "Buksefjorden: Grønlands første vandkraftværk satte verdensrekord" (in Danish). Arctic Business Network. 19 February 2014. Retrieved 21 December 2015. ↑ "Human history". Nuuk Tourism. Archived from the original on 15 June 2010. Retrieved 12 July 2010. ↑ "Nuuk". Encyclopædia Britannica . Retrieved 12 July 2010. ↑ Wurm, Stephen A.; Mühlhäusler, Peter; Tyron, Darrell T. (1996). Atlas of Languages of Intercultural Communication in the Pacific, Asia, and the Americas, International Council for Philosophy and Humanistic Studies. Volume 2, Part 1 Volume 13 of Trends in Linguistics. Walter de Gruyter. p. 1051. ISBN 978-3-11-013417-9. ↑ "Nuuk travel guide". Archived from the original on 12 April 2009. Retrieved 24 May 2009. ↑ Scandinavian Review. American-Scandinavian Foundation. 1921. p. 681. ↑ Lemkin, Raphael (1 June 2008). Axis Rule in Occupied Europe. The Lawbook Exchange, Ltd. p. 167. ISBN 978-1-58477-901-8. ↑ Lüdecke, Cornelia. "East Meets West: Meteorological observations of the Moravians in Greenland and Labrador since the 18th century". History of Meteorology 2 (2005). Retrieved 27 April 2012. ↑ Wittman, P. "Greenland". The Catholic Encyclopedia. Robert Appleton Co. (New York), 1909. Retrieved 28 April 2012. ↑ "CIA World Factbook – Greenland". 1 2 Daley, Paul (29 June 2016). "Which is the world's most indigenous city?". The Guardian . Retrieved 29 June 2016. ↑ Nicoll, James. An Historical and Descriptive Account of Iceland, Greenland and the Faroe Islands . Oliver & Boyd, 1840. ↑ O'Carroll, Etain (2005). Greenland and the Arctic. Lonely Planet. p. 154. ISBN 978-1-74059-095-2. 1 2 3 4 "Nuuk Kommune" (in Danish). Den Store Danske. Retrieved 21 December 2015. ↑ On 11 October 2015, the magnetic declination between the North Pole and Nuuk was "27° 49' W ± 0° 33' changing by 0° 22' E per year", calculated with NOAA's Magnetic Field Calculators, National Geophysical Data Center. ↑ "Magnetic declination in Nuuk, Greenland". Magnetic Declination. Retrieved 22 December 2015. ↑ "DMI Report 18–19: Climatological Standard Normals 1981–2010 Denmark, The Faroe Islands and Greenland Based on Data Published in DMI Reports 18–08, 18–04 and 18–05" (PDF). Danish Meteorological Institute. Archived from the original (PDF) on 10 February 2019. Retrieved 10 February 2019. ↑ "The Observed Climate of Greenland, 1958–99 with Climatological Standard Normals, 1961–90" (PDF). Danish Meteorological Institute . Retrieved 10 February 2019. ↑ "Station Nuuk" (in French). Météo Climat. Retrieved 10 February 2019. ↑ "Nuuk Climate Normals 1961–1990". National Oceanic and Atmospheric Administration. Retrieved 17 February 2019. ↑ "BBC Weather – Nuuk". BBC Weather. Retrieved 27 March 2011. ↑ "Population in localities by gender, age and place of birth 1977–2015 [BEEST4]". Statbank Greenland. Retrieved 21 December 2015. ↑ "Asii Chemnitz Narup" (in Danish). Kalaallisut. Archived from the original on 22 December 2015. Retrieved 21 December 2015. ↑ "Members of Inatsisartut". Inatsisartut. Archived from the original on 4 March 2016. Retrieved 21 December 2015. ↑ "Political parties in Greenland". Statistics Greenland. Retrieved 21 December 2015. 1 2 "Sermitsiaq mener: Hvem ka'? Kanukoka!". Sermitsiaq (in Danish). 20 May 2010. Archived from the original on 23 May 2010. Retrieved 9 July 2010. ↑ "KANUKOKA juulip 31-ani atorunnaartussanngortoq". Kalaallit Nunaata Radioa. ↑ "Hvad er KANUKOKA?" (in Danish). KANUKOKA, Official Website. Archived from the original on 21 July 2011. Retrieved 9 July 2010. ↑ "Minister for Social Affairs". 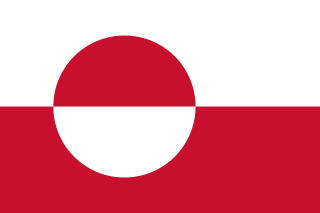 Government of Greenland. Archived from the original on 28 July 2011. Retrieved 9 July 2010. ↑ Jones, Michael; Olwig, Kenneth (2008). Nordic landscapes: region and belonging on the northern edge of Europe. University of Minnesota Press. p. 118. ISBN 9780816639144. ↑ Barkham, Patrick (23 December 2016). "Greenland: the country set to cash in on climate change". The Guardian. Retrieved 12 December 2018. ↑ World of Information Regional Review: Europe. Kogan Page Publishers. 2003. p. 164. ISBN 978-0-7494-4067-1. ↑ "Historie" (in Danish). Nukissiorfiit. Archived from the original on 27 July 2017. Retrieved 21 December 2015. ↑ Bjerregaard, Peter; Young, T. Kue (1998). The circumpolar Inuit: health of a population in transition. Wiley-Blackwell. p. 55. ISBN 978-87-16-11905-6. ↑ Europa World Year, Book 1. Taylor & Francis Group. 2004. p. 1458. ISBN 978-1-85743-254-1. ↑ "airgreenland.com". Archived from the original on 26 April 2010. 1 2 De Store Fagbøger. Grønland. Gyldendal Uddannelse. 2004. pp. 37–. ISBN 978-87-02-02629-0. ↑ O'Carroll, Etain (2005). Greenland and the Arctic. Lonely Planet. p. 231. ISBN 978-1-74059-095-2. ↑ "Grønland: Infrastruktur" (in Danish). Europas-Lande.dk. Retrieved 22 December 2015. ↑ "Nuup Bussii udvider bestyrelsen" (in Danish). Sermersooq Municipality, Official Website. Archived from the original on 30 June 2010. Retrieved 13 July 2010. ↑ "Lokalplaner og kommuneplantillæg for Nuuk" (in Danish). Sermersooq Municipality, Official Website. Archived from the original on 21 July 2011. Retrieved 13 July 2010. ↑ "Nuup Bussii A/S". Nuup Bussii, Official Website. Retrieved 13 July 2010. ↑ "Om NB" (in Danish). Nuup Bussi. Archived from the original on 4 May 2016. Retrieved 22 December 2015. ↑ "Hans Egede House". Lonely Planet. Retrieved 22 December 2015. ↑ "Nuuk – Ein Stadtrundgang" (in German). Grönlandinfo.de. Retrieved 31 December 2015. ↑ "Nuuk Things to Do". Virtual Tourist. Retrieved 31 December 2015. ↑ "Velkommen til Nuuk Kunstmuseum – fortids- og nutidskunst". ↑ "About the University". Archived from the original on 28 September 2007. . "ca. 150 studenter; 14 lærere foruden rektor samt 5 teknisk-administrativt ansatte." ↑ "About Us". Groenlandica, Greenlandic National Library. Archived from the original on 21 July 2011. Retrieved 9 July 2010. ↑ "Collections". Groenlandica, Greenlandic National Library. Archived from the original on 21 July 2011. Retrieved 9 July 2010. 1 2 "World Stadiums – Stadiums in Greenland". Archived from the original on 5 June 2011. ↑ "Skiliften Sisorarfiit" . Retrieved 6 May 2013. ↑ Webster, Bob (10 May 2010). "General Aviation Flying to Europe" . Retrieved 6 May 2013. ↑ Nuuk Golf Course Greenlandtoday. ↑ "Aalborg Twin Towns". Europeprize.net/. Archived from the original on 7 September 2013. Retrieved 19 August 2013. Wikivoyage has a travel guide for Nuuk . Wikimedia Commons has media related to Nuuk . Nuuk – Greenland's largest city and capital . Visitgreenland.com.